This is another entry about one individual day. 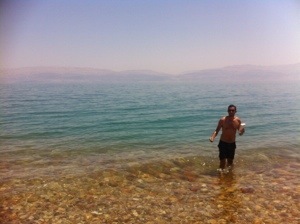 We finally got to visit and swim in the Dead Sea: the lowest point on Earth and where no one can sink. During the previous evening we encountered a British girl, Abbie, and her American friend, Seth. 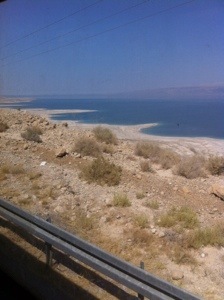 They were also intending to visit the Dead Sea in the morning so we arranged to do go together. Seth was particularly interesting as this was his first time beyond the US and he had already had his bags confiscated because they suspected something in his baggage. We woke up on our rooftop at the normal time, with the Muslim call to prayer and the cool morning breeze. However, this night was the worst yet. It had not been as chilly as previous nights. 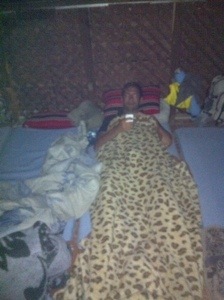 This meant the Mosquitos were thriving on my face. For some reason James survived the night unharmed, whereas I woke up with a face full of bites, reminiscent of my acne days of yesteryear. Despite my broken sleep we were on our way to the bus station as soon as we finished our cereal. Once there we had to wait a short while before getting a bus directly to the Dead Sea. Once we arrived at our destination point on the Dead Sea coast we quickly realised the severity of the heat at the worlds lowest point. The screen beside the entrance to the water indicated that temperatures were approaching 40 degrees. James and I were not going to hang about waiting to get sweaty and were stripped and ready to dip in no time. James was the first in and followed the written instructions (beside the ‘do not swim’ sign) to walk in, squat and then float. 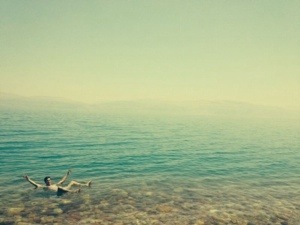 His first experience of buoyancy in the Dead Sea was greeted with an uncharacteristically feminine sound. I was quick to follow, keen not to miss out on the action. 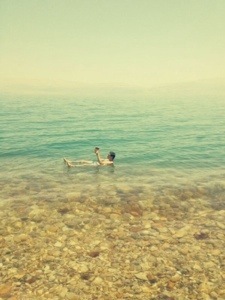 As I began to float on the Dead Sea there was something quite surreal about floating with no aid of my arms or legs. In fact we could put all four above the water and float using only our torso. It could, quite ironically as it’s the lowest point on earth, be described as the closest thing one will experience to the weightlessness of space travel. The incredibly high salt content of the water quickly reminded me of the mosquito bites I’d suffered the previous night and indicated that my bottom had not quite recovered from the chaffing it endured during Trailwalker. Still, salt is a healer. Our compatriots, Abbie and Seth also dipped into the sea breifly. However both found the 40 degree heat slightly unbearable and seemed out shade quite quickly. 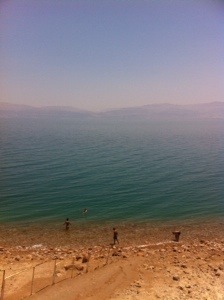 James was the first to discover that the Dead Sea is not kind on the eyes or the throat. He lost temporary vision as a result. Both of us decided to copy a Japanese man that we spotted nearby and pose reading our books in the sea. It was just another way of showing off our ability to float without effort, like lifting both your hands in the air when on a bicycle (a skill I have yet to master). We then showered in salt free water before joining the other two for a spot of shading and conversation. It seemed to reach 3:30 in no time, at which we had to return to the bus stop in anticipation for the bus. 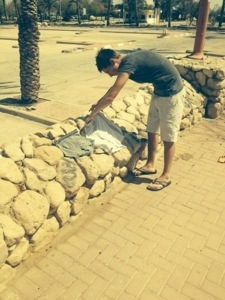 I used the waiting time, and the intense heat to dry some of my wet clothes (a lack of swimming trunks has led to me bathing in see through football shorts. Since no one wishes to be exposed to my private area I have now resorted to pants and shorts when I bathe – cleaning both at the same time). It seemed the perfect opportunity. We were joined at the bus stop by a Jewish lady and her daughter (both from Manchester but living in Israel by birthright). None of us knew where they came from as we were in the middle of the dessert and they certainly hadn’t been to the beach. Upon arrival back at the hostel we had a light snack and a nap to accompany a lemon juice before retiring for the evening for our last night on the roof in preparation for our early morning bus to Eilat. 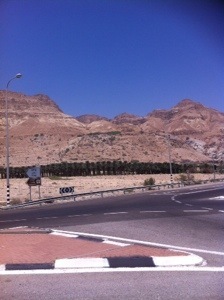 Next Eilat, Israel – Med, Dead then Red.